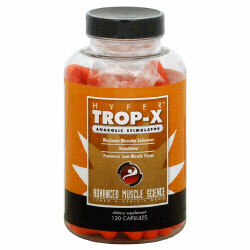 Advanced Muscle Science Hyper Trop-X On Sale! Dietary supplement. Maximum muscular endurance. Vasodilator. Preserves lean muscle tissue. Learn. Apply. Grow. Hypertrop-X is a scientifically formulated muscle stimulator that helps deliver energy needed to power through grueling workouts, work out longer, achieve maximum muscular endurance and preserve lean muscle tissue. These statements have not been evaluated by the Food and Drug Administration. This product is not intended to diagnose, treat, cure or prevent any disease. Ingredients: Proprietary Blend MRA Technology: (Beta Alanine, L-Leucine). Other Ingredients: Gelatin, Essential Oil - Orange, Magnesium Stearate, FD&C Red No. 3/Yellow No. 6 and Titanium Dioxide. Store in a dry, cool place with lid tightly closed.